Banagher old Church stands high on what is left of an ice age drumlin, though much of the sand and gravel have been carried away by now. It is first mentioned in 1121, but it may be older than that. 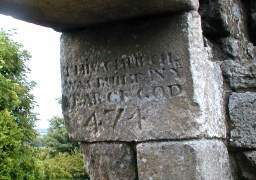 Some joker in the 1730s carved the words: "This church was built in ye year of God 474" into the inside of the entrance which, considering that the English language did not exist at the time, was a pretty stupid move . The unknown mason clearly had much stamina and a large chisel but his ploy of trying to connect Banagher old church with St Patrick has failed miserably so far. 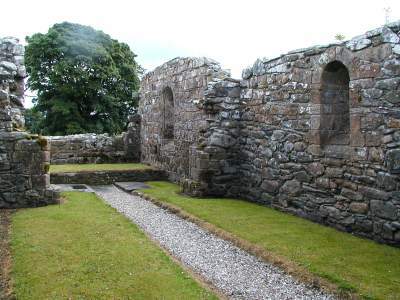 It is thought that the church was founded in the late 11th century, possibly by the MacLoughlainn kings. It was already ruined by 1622, as a contemporary survey of churches mentions. 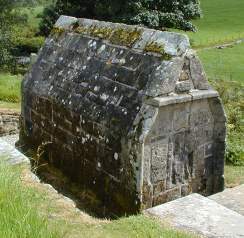 Outside the church is this well preserved mortuary house, similar in construction to the one at Bovevagh church. Traditionally it is said to contain the remains of St Muiredach O'Heney. It is well built and the west gable shows a damaged carved panel. Notice also that the level of the structure is quite low. The same applies to the church. Originally the buildings were on top of the hill, but long centuries and many burials have raised the ground level considerably, so that now it is several feet higher than the church and mortuary house.